The European Union is under attack from all sides. To many on the Right in Europe, it seems to be an over-regulated bureaucracy that is undermining the bloc's competitiveness. To those on the Left, it appears in the guise of the International Monetary Fund in Latin America in the 1990s -- a vehicle for imposing neoliberalism on an unwilling population. In creditor countries such as Finland and Germany, citizens are angry about the creeping mutualization of eurozone debt, which they fear will force the fiscally responsible countries to subsidize the irresponsible. In debtor countries such as Italy and Greece, people are angry about the imposition of austerity, which is increasingly identified with the EU, particularly Germany. Eurobarometer polling shows that there has been a dramatic drop in support for the EU across the continent since the euro crisis began. Before the crisis, Britain was by far the most Eurosceptic country in the group and David Cameron has now promised to hold a referendum on leaving the EU altogether if he wins the next election. Remarkably, the data suggests that the four largest eurozone countries now have even lower levels of trust in EU institutions than Britain did in 2007. This loss of support for the EU is likely to be reflected in the European elections at the end of May, in which Eurosceptic parties are expected to make a strong showing in three key member states. In France, Marine Le Pen's far-Right National Front, which wants France to abandon the euro, is expected to emerge as the biggest party with over 20 per cent of the vote. In Italy, Beppe Grillo's Five-Star Movement, which wants a 'different Europe', is expected to be even more successful. UKIP is likely to increase its current tally of 13 seats in the European Parliament. This could lead to an increasingly fractious European Parliament that could block attempts for eurozone reform that is seen by European elites as the only way to prevent a repetition of the crisis. Such a lineup in the European Parliament may force the mainstream parties of Left and Right to form a pro-European bloc -- what Marine Le Pen calls 'UMPS' (a merger of the initials of France's centre-right UMP party and the centre-left PS). 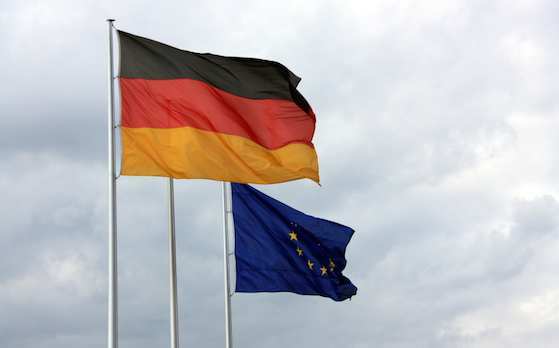 One of the European countries in which Eurosceptic parties do not reach double digits in opinion polls is Germany, perhaps also the most important country in determining the future of Europe. Since the euro crisis there has been a consensus -- embodied by Chancellor Merkel, who now leads a grand coalition with the Social Democrats -- that 'more Europe' is the answer. Many have argued that this shows the resilience of Germany's commitment to Europe. But the political dynamic in Germany is much the same as elsewhere in Europe -- according to Eurobarometer, there has been a 32-point drop in support for the EU since 2007 -- and Eurosceptic voices have gradually been getting louder. Although Merkel was re-elected to a third term as Chancellor last September -- an apparent endorsement of her step-by-step approach to the euro crisis -- Germany's new Eurosceptic party, the Alternative für Deutschland (Af D), took nearly five per cent of the vote and thus almost won seats in the Bundestag, an impressive result for a party that was only formed in February last year. The AfD -- a direct challenge to Merkel's declaration that 'there is no alternative' to her approach -- is expected to do even better at the European Parliament elections. Recent polls suggest it will win 6 to 7 per cent of the vote. In any case, because the German constitutional court has abolished the three per cent threshold, it will sit in the European Parliament after the elections. The strategy of Merkel's Christian Democrats has been to stigmatize the AfD as a far-Right party -- even though it is plainly quite different from the neo-Nazi parties that have threatened to enter the Bundestag in the past. One interesting question is whether, after the European elections, the AfD will join the British Conservatives in the European Conservatives and Reformists group. Christian Democrats would regard this as a 'declaration of war', as a leading German Christian Democrat politician put it to me. That would in turn complicate Cameron's attempt to renegotiate Britain's relationship with the EU for which he needs Merkel's support. Even more worrying for pro-Europeans in Germany than the emergence of the AfD is the increasing Euroscepticism of Germany's intellectual elite. European integration was perhaps even more of an elite project in Germany than elsewhere in Europe; there has never been a referendum on any step in European integration such as the introduction of the euro or the Lisbon Treaty. But since the crisis there has been the beginning of a backlash. Some of Germany's leading intellectuals on both the Left and Right are now increasingly uncomfortable with Merkel's European policy. In a country in which public intellectuals are still hugely influential, this could in the end have an even greater impact than the AfD. What is driving German Euroscepticism above all is fear of the emergence of a 'transfer union' in which the prudent countries -- with German at the forefront -- cover the debts of the imprudent. Concern in Germany has been growing since Mario Draghi, the European Central Bank president, promised in the summer of 2012 to do 'whatever it takes' to save the euro and the subsequent creation of the bond-buying programme known as Outright Monetary Transactions. In much of Europe this was seen as a breakthrough which lifted the sense of doom hanging over the eurozone. In Germany, it was seen as a defeat. One young Eurosceptic historian, Dominik Geppert, warned in a recently published book that 'Maastricht' -- the treaty that created the single currency -- might in future come to take on similar connotations in Germany as 'Versailles' did after the First World War. Alongside this economic debate, there is also a parallel legal debate in Germany. Constitutional lawyers such as Udo di Fabio and Paul Kirchhoff -- both Eurosceptic former constitutional court judges -- argue that in response to the crisis, European policy-makers have suspended legal and democratic norms and created a Verfassungsnot, or 'constitutional emergency'. Some implicitly compare the steps taken to stabilize the euro to the Nazi seizure of power. In an interview with Der Spiegel last year, Konrad Adam, a 71-year-old former journalist for the Frankfurter Allgemeine Zeitung who is now one of the leading figures in the AfD, compared the party's opposition to Merkel with resistance against the Nazis. Some influential figures on the left also increasingly share the concerns of these right-wing Eurosceptics. Perhaps the most influential is Wolfgang Streeck, the director of the Max-Planck Institute, who argued in a recent book, to be published in English in May as Buying Time: The Delayed Crisis of Democratic Capitalism, that the EU is a 'liberalization machine' that makes labour markets more flexible and enforces budget cuts against the will of citizens. Meanwhile, Heribert Prantl, a commentator for the Süddeutsche Zeitung, the leading centre-left newspaper, has been as critical as right-wing Eurosceptics about the perceived violation of the no bailout clause of the Maastricht Treaty which specified that member states should not be liable for, nor assume, the commitments or debts of any other. Thus, whereas in much of Europe pro-European elites are under attack from Eurosceptics claiming to speak for the people, in Germany the elites themselves may be changing their minds. As Gideon Rachman has pointed out, two of Germany's most respected institutions -- the Bundesbank and the Constitutional Court -- have now declared their opposition to the Outright Monetary Transactions programme. Merkel may find herself more constrained than ever -- particular in taking steps towards the debt mutualization than many economists think is necessary to solve the crisis and restore growth in Europe. "Germany's Elite Falling Out of Love with EU"